Globe Tattoo brings you the service you’ve all been waiting for – SUPERUNLI25! 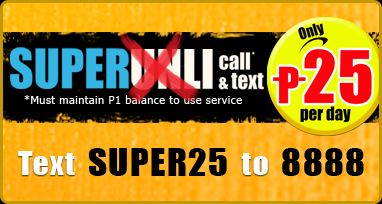 Ever heard of superunli 25? It's the latest offering from globe that gives you unlimited call and text to globe/TM/tattoo subscribers. Basically, it's supposed to be a more convenient option from the existing superunli 150 which is unlimited call and text for 1 week. 1. Unreasonable number of call. 2. Unreasonable length of call time. We apologize for the inconveniences this may have caused you. The fair use policy states that call and text offers are applicable for person to person transactions only. They are not intended and should not be used for commercial purposes. Call and text offers must not be abused by the subscribers (i.e. subscribers must not make an unreasonable number of calls or make unreasonably prolonged calls). Globe reserves the right to suspend promo subscription/s of accounts suspected to be engaged in such activities to prevent network abuse and to fully optimize network capacity and maintain quality of its services. Network abuse pertains to 1) an unreasonable number of calls originating from a single account and 2) calls made for an unreasonably prolonged length of time. These activities may prevent Globe from fully optimizing network capacity and maintaining the quality of its services. Globe has decided to reinforce the control measures on network abuse to ensure that our valued subscribers will continue to experience quality services from Globe. Rest assured that we are always looking for ways to serve our subscribers better. But banning the subscriber's number from joining promos is very frustrating to most users specially those who are using globe for more than 5 years. They will need to buy another sim card in order to avail promos. I understand that globe just wanted to maintain its QoS (Quality of Service) but they should have given the subscribers a disclaimer or warning that their number might be banned from promos if they use the service excessively. Of course this subscribers are unaware of the circumstances given that globe didn't provide enough information that's why I feel for them. Globe could have added a feature that limits the length of call time per call or an interval of 5-10 seconds per text messages. Good thing I don't normally register to unlimited offerings. Am I seeing a "people of the philippines versus Globe Telecoms" class action lawsuit here? What are your thoughts? share them on the comments section below. update: A lot of people claimed that they have switch to sun or red due to this unfair "fair use policy". laht tlga ng unli subscription tinatanggal ng globe?? then it shouldn't be called unlimited if they are enforcing the ban. how long a call or how many messages is considered unreasonable? putting a number to that already means it is very limited. that is very deceitful of them. It's really confusing. I just got blocked from using their promos and I didn't know how did I abused their services. :( Am I permanently blocked? iT IS frustrating to register in the first place. I have been trying to register for 2 weeks now, all reply I get is "sorry,your SUPERUNLI registration can't be processed at this time due to the numebr of users currently registered to this promo. Please try again later...."""